KIEV, Ukraine -- Ukraine has proposed a time and a place for talks on Saturday on reaching a durable ceasefire with pro-Russian rebels and is awaiting a reply, the president's website said, as fighting in the east killed 13 servicemen. The website did not name the venue but a Western diplomat expected the talks to be held again in eastern Ukraine's major industrial hub of Donetsk, where the rebels control key points. In some of the worst violence since President Petro Poroshenko called off a 10-day unilateral ceasefire on June 30, Ukraine's "anti-terrorist operation" (ATO) headquarters said at least 13 Ukrainian military personnel had been killed on Friday. More than 200 people on the government side have been killed, as well as hundreds of civilians and rebels, in more than two months of fighting in Russian-speaking eastern regions that want to quit Ukraine and join Russia. Kiev said Ukrainian military personnel had sustained losses from sniper fire on its position near the rebel stronghold and flashpoint city of Slavyansk, where shelling has left roads pockmarked and buildings damaged and burnt out. ATO headquarters said on Friday it had regained control of the nearby village of Mykolayivka after heavy fighting. "In the course of the operation, a large number of terrorists were taken prisoner and a significant arsenal of various weapons were taken," a statement on Facebook said. Slavyansk, a city of 130,000, and surrounding villages have been the main focus of Ukraine's military drive to force out fighters loyal to rebel commander Igor Strelkov, a Muscovite. Strelkov made an impassioned appeal to Russia on Friday, warning on a rebel website that without Moscow's help the entire region the rebels lay claim to, known as Novorossiya (New Russia), would fall to Kiev's forces. "Slavyansk will fall earlier than the rest," he wrote. Russia's foreign ministry accused Ukraine of endangering innocent civilians in the region. "We call on the Ukrainian authorities to cease firing on civilian targets and residential areas," it said. 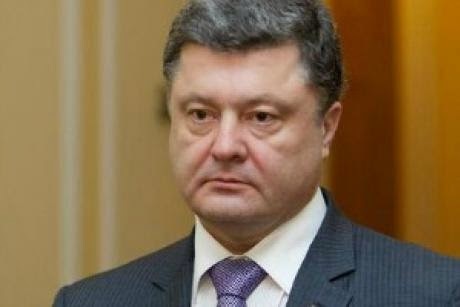 The statement on Poroshenko's website said he had informed European Union foreign policy chief Catherine Ashton that Kiev had proposed a time and a place for Saturday's talks. Separatist officials have suggested the venue could be a problem since rebel leaders could be subject to arrest by Ukrainian authorities if they move out of their strongholds. "(The talks) cannot be held outside Ukraine because it is felt this would inflate the status of the rebels," the Western diplomatic source said. Russia's economy may face more sanctions from the United States and the EU if the separatists fail to de-escalate the crisis, an issue that U.S. President Barack Obama and German Chancellor Angela Merkel discussed again on Friday. "The President and the Chancellor agreed that the United States and Europe should take further coordinated measures to impose costs on Russia if it does not take steps toward de-escalation in short order," the White House said in a statement. Ukraine's foreign minister and those of Germany, France and Russia agreed in Berlin on Wednesday that another meeting of the so-called "contact group" should be set up by this weekend with rebel leaders to agree on a more effective ceasefire. The group includes a former Ukrainian president, Moscow's ambassador to Kiev and a high-ranking official from the Organisation for Security and Cooperation in Europe (OSCE). Earlier on Friday, Poroshenko, Merkel and French President Francois Hollande spoke by telephone in what appeared to be a fresh effort to get the meeting organized. They agreed "that a mutual ceasefire and cooperation between Ukraine and Russia on securing the border are necessary steps to stabilise the situation. Russia ... is urged to use its influence over the separatists," Merkel's office said. Ukraine is demanding that Russia prevent arms and volunteer fighters from crossing their long shared border. It also wants the release of all hostages. Russia denies orchestrating the conflict or sending in fighters and weapons. Armed separatists captured key buildings in eastern Ukrainian cities in April, soon after Russia annexed Ukraine's Black Sea peninsula of Crimea, and have declared "people's republics" in a bid to follow its example and join Russia.